We take a few minutes to chat with Emily about what inspires her, the importance of early education and what she has in store for the children of Guardian Queen Street. Hi Emily, what initially inspired you to pursue a career in early education? I have had some very influential teachers in my life and I decided I wanted to be that figure for the children of today. The first five years are vital for the promotion of lifelong learning and I see educating the children at Guardian Queen Street as an opportunity to instil a foundation of competence, inquiry and confidence for children to carry with them throughout their life. The most rewarding part of being an early childhood educator is seeing a child hypothesise their ideas and being able to scaffold their visions through play and interactions with others. It’s gratifying to watch the children grow and develop through their investigation and research process where they source many different answers to a thought provoking question. Every day is different and full of surprises. Children at the centre recently made a handwritten thank you note for their families, which we tied to a flower and gifted to each family on arrival at the centre. You’ve been fortunate enough to visit Reggio Emilia in Italy with Guardian. What impact has this made on the educational program at Queen Street? I found the trip to Reggio Emilia insightful, motivating, eye opening and exciting. I’ve been able to bring back a greater understanding of quality documentation for children and families. I have focussed more on encouraging educators and families to listen to the multiple languages of children, as well as allowing children time for deep thinking around concepts that they are exploring. Aside from Reggio Emilia, where’s one place in the world you’d love to travel to and why? I would love to go anywhere with a beach and a licence to go fishing! I have a dog named Charlie and he is a whippet x kelpie – he is one of the two loves of my life! My signature dish would be crumbed Fraser Island whiting. I would love to see into the future! What’s in store for the children at Queen Street? We have recently built a connection with a small school in rural NSW called Pooncarie Public School. The school requires many items such as musical instruments, sports equipment and stationary. We’re looking forward to building a relationship with the centre, exchanging letters, ideas and resources. 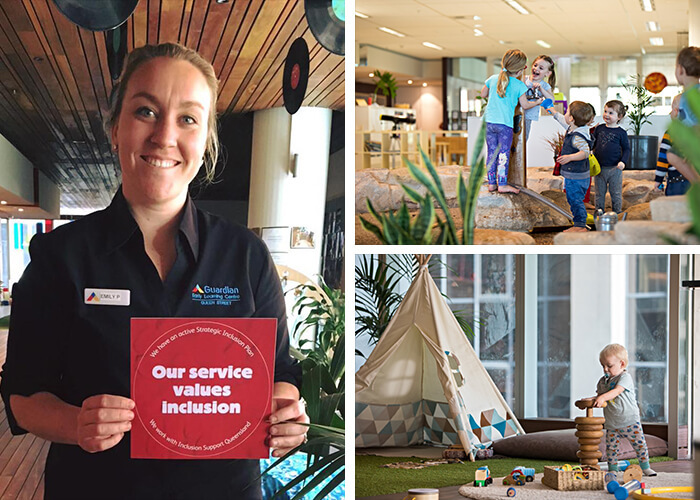 To find out more about this wonderful early learning centre in Brisbane and to book a tour, head here.